fleeting moments. It consequently leads to the use of watercolor to best create effects to convey concepts by shaping and arranging the different creative layers the medium offers. I work from my photos, from life and from my own sketches, many done on site. I enjoy using vibrant colors, layered washes and textures to intertwine with the subject. I wish my paintings to feel fresh and spark joy to the viewer, in even greater measure than I experience in the creation process. I am from Northern Virginia, brought up in a household where creativity has always been encouraged. I developed artistic interests at an early age. I received a Bachelor of Fine Arts Degree from the Maryland Institute College of Art. At that time, I experimented with many mediums. After graduation, after being required to work mostly with oils, I was able to follow my instincts more, drawing closer to watercolors. I strive to explore the limitless possibilities watercolor painting offers and delight in the endless effects that can be produced. I paint a variety of subject matter, en plein air, from life or from photos. What I find most stimulating are the seemingly commonplace moments or scenes that are often overlooked. I try to convey concepts by shaping and arranging the different creative layers the medium offers. At present, I live in Italy with my husband and two daughters. 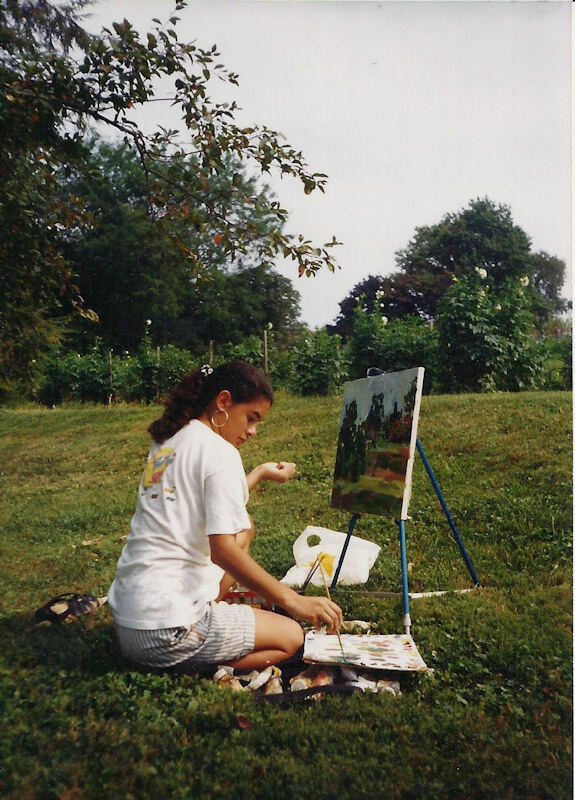 En plein air oil painting, near my family's home in Virginia, 1991.